I guess I am wondering why there is no discussion around attaching pegs to tip over bars? Is it mostly preference or comfort or? They sure look nice? Hwy pegs can be aquired for a lot less $$$. No problems removing the fairing. The hole, even with the rubber gromets is slightly larger than the pegs and clevis. Just remove the screws and it will slip right off. To be honest this is sorta a bad time with work and the rally just around the corner. It is a long weekend so I may be able to work a little magic. I will keep you posted. Well thank you Snarf but if this is a busy time then don't worry about it for now- and you should get to enjoy your holiday weekend too! The bike is new to me, maybe I should just try it like it is and see how I like it. The stock foot pegs are certainly much bigger and more comfortable than what I have on the EX! Well a nice long two-up ride reveals that am missing the highway pegs that I've become so used to on my other bike. Looks like I'll need a set whenever you have time! Thanks Snarf. Sent you a PM snarf. 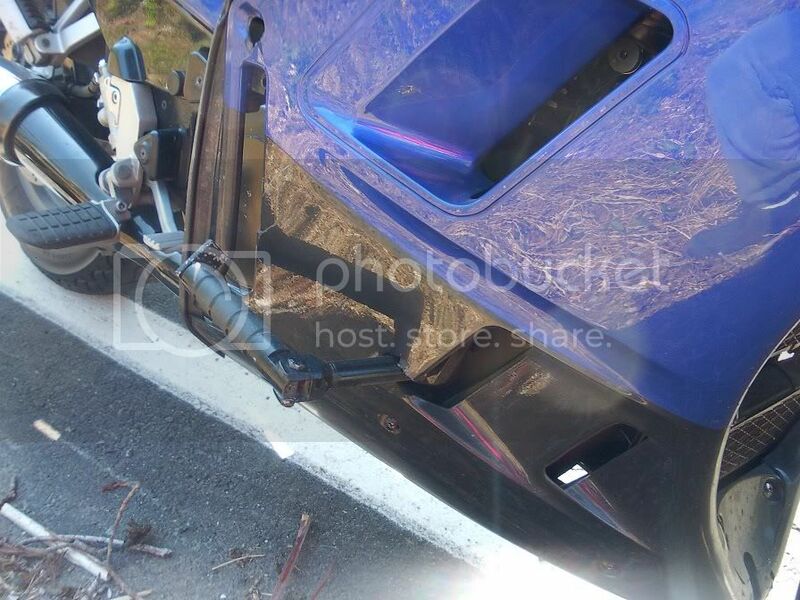 Just wanted to give a big "Thank You" to Snarf, for rushing out a set of his highway pegs (and block-off plates). They look great, and the installation is almost done. (Yea they're the "VC" ones, and I'm about to "take the plunge" with the hole saw. Nah,,, it doesn't look that bad!) I was doing the valve adjustment on the bike anyway so Connie was in the perfect state of undress, and the top end looks sooo much better without all that hose clutter. Nice products, thanks Snarf! Hi Snarf. Was waiting to hear back from you on getting a set. Any word? A little follow-up... Snarf your highway pegs really saved the day on our trip to Tennessee a couple of weeks ago. The ankles were getting a little hot ( ) while riding in full gear in 102 degree weather. (Like, blistering!) So it was really nice to be able to move my feet out of the burn zone and onto the highway pegs, it helped a lot. Thanks again Snarf! Snarf!!!! Your pegs are deer proof. Had my first run in with a deer last week. The deer came out of nowhere and it happened so fast. all I could do was hang on. I just rode it out and came to a stop. I didn't go down. The deer hit me right in front of your peg and ripped everything that was bolted on the right side of the bike Off. I didn't know the parts were ripped off till I turned around. Saddle bag, the little scoop by the right leg. Man what a mess all the way around. I feel your pegs saved my right leg from getting smashed. I was doing around 50 mph. WOW that is fantastic and sad news all at the same time. I hope to be able to use both my arms in the near future and be able to get back into making things again. Im glad that you made it through the experience safe.